You'll be surprised how many threats endanger Aboriginal land. Indigenous people have to fight on many fronts to keep alive their heritage, history and sacred sites. 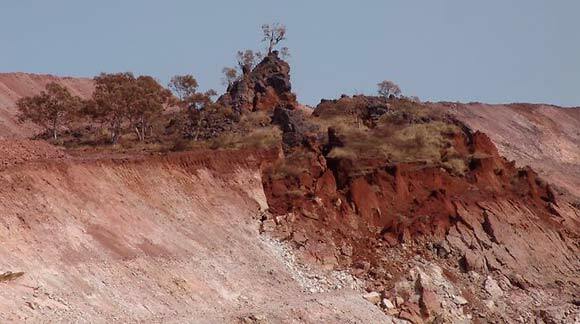 Climate change affects Aboriginal land already. Torres Strait Islanders are noticing visible changes to their land, including erosion, rough seas and higher storm frequency, according to former Aboriginal and Torres Strait Islander Social Justice Commissioner Tom Calma . Other risks include king tides, and ocean acidification and its effects on coral reefs and fish. Extreme weather conditions have the potential to reduce water availability and erode infrastructure like sewerage systems and housing on the islands. Many villages are only about 2 metres above sea level. At least 6 islands urgently require the construction of sea walls and coastal erosion control measures : Poruma (Coconut) Island, Warraber (Sue) Island, Iama (Yam) Island, Masig (Yorke) Island, Boigu and Saibai. Most of these islands have their own airstrips. Map: On Iama (Yam) Island, Torres Strait, residents' homes are already frequently inundated with sea water . The island could be lost to the sea if no conservation measures are taken. The 2008 Garnaut Report identified the Torres Strait as especially vulnerable. Over the next century the sea-level is expected to rise by up to 59 centimetres . "There is a real possibility that some communities will need to move to higher ground or relocate altogether to the mainland," Calma said. Shaun Edwards from far North Queensland agrees, predicting that "Torres Strait Islanders will end up coming to the mainland" , an option not considered by others such as Climate Change Minister Penny Wong . Fred Gela, Mayor of the Torres Strait Island Regional Council, says that "the land and sea in the Torres Strait is a critical part of our spiritual and physical identity." Inaction would put at risk the survival of their way of life which is unique in Australia. But Aboriginal people are well-placed "to help mitigate the impacts of climate change because of where they live and their unique knowledge of the land," says Joe Ross, Chair of the Northern Australia Land and Water Taskforce . 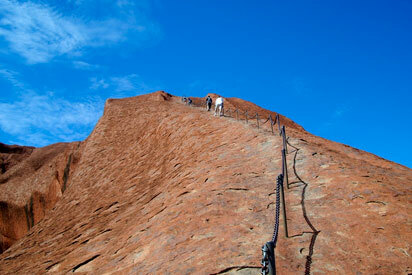 Percentage of visitors who climbed Uluru in 2010 ; in 2012: just over 20% ; in 1993: almost 75% . People who have died climbing the rock . Tourism can often peacefully coexist with Aboriginal land, but sometimes is a threat to Indigenous interests. Uluru (formerly known as Ayers Rock) is one such example. For Aboriginal people Uluru is a sacred site and should be off-limits for non-Indigenous visitors. Demands to close the only climb in respect to the rock's significance have been made many times. But Uluru is an icon of international value for Australia's tourism industry. When yet another call for its closure was made in early 2010 the Prime Minister Kevin Rudd, NT Chief Minister Paul Henderson and Environment Minister Peter Garett were compelled to call for Uluru to be kept open because "the future for this internationally significant icon lies in visitor experiences that reflect its World Heritage values" . Unfortunately some of Uluru's annual 100,000 visitors don't care much about its sacredness or the signs that discourage a climb and pee and defecate on it . Many more party or urinate up there. Visitors from all over the world take home parts of the rock, and many feel haunted for months after, subsequently sending back their stones to Australia. Disrespectful tourists on top of Uluru. British tourists (left), a French tourist (middle) and another man pose on the sacred "heart centre of Australia". "I do not mean in any way to offend the Aboriginal culture," claimed the French tourist, but she outraged Indigenous and non-Indigenous people around the world with her stupid action. Other tourists were photographed on Uluru playing golf. Recreational and off-road vehicles used by tourists and locals can damage Aboriginal sites in conservation areas and national parks. For example, the Arthur-Pieman Conservation Area in Tasmania, described as "one of the world's greatest archaeological regions"  for its Aboriginal heritage, has been subjected to damage for many years. Most if not all tracks in the area go over Aboriginal heritage sites. Attempts to close tracks to prevent damage failed because "people have pulled [barriers] out and gone around them" . A strong vehicle lobby vetoes attempts to implement barriers. Maximum legislated fine in Tasmania for destroying historic European heritage . Fine a court ordered electrical company Ausgrid pay in 2013 for destroying a significant rock engraving on Sydney’s north shore in late 2010. Maximum fine for a corporation available to the court: $220,000 . Number of turtle nests found by an environmental impact study commissioned by the Department of State Development in WA . Number of turtle nests found by a peer-reviewed independent study for the same region . Turtles are an endangered species. Developers' projects such as infrastructure, businesses and dwellings often threaten to damage or destroy sacred sites, rock art or places of great important to the local Aboriginal people. Sometimes Aboriginal artefacts make their way into fill used to fill excavated areas , hundreds of kilometres away from the artefacts' home country. For example, in late 2009 the 'Guardian Tree' at Bulahdelah in New South Wales, "the most sacred site of the Worimi nation", was cut by workers with chainsaws, backed by police who kept the protesters away . The tree made way for a highway bypass. At the same time Aboriginal people in Tasmania were fighting the Brighton Bypass which was bulldozed through land rich of significant sites with an estimated 3 million artefacts and "one of the most important archaeological sites in Tasmania" according to head archaeologist Rob Paton . It was confirmed to date back 40,000 years, making it the oldest site in the southern hemisphere with evidence of human habitation . The government decided to build a bridge over the area despite two years of meetings, lobbying, court challengens to heritage legislation, an emergency national heritage listing, dozens of arrests and protests which even gained support of many of the workers employed to build the bridge . Two days before Christmas 2011 the site, also referred to as Kutalayna (Jordan River Levee), was placed on Australia's National Heritage List , which puts it on the same level as Uluru and the Great Barrier Reef. observe this land that is now bare. for this spiritual sanctuary we're meant to share. toxic waste dump proposals ensure an early grave. refuse to submit to modernity's farce. seeking revenge for two centuries of despair. those ancient guardians who lived here first . In June 2010 Gomilaroi Elder Lyall Munro was fighting the sale in Moree, NSW, of a site known to have been an Aboriginal burial ground. The NSW government had approved the sale to retailing giant Woolworths. Munro believes the remains of 39 people could still be in the site . When disputes between Aboriginal stakeholders involved in negotiations for a proposed multi-million-dollar gas hub near Broome, in Western Australia, took too long the Western Australian premier simply announced to compulsorily acquire the land. But instead of the 3,500 hectares under negotiation the government wanted to acquire 20,000 hectares for "some flexibility to identify final locations" . Bev Manton, Chairperson of the NSW Aboriginal Land Council, observes that "some 900 sites have been destroyed in recent years… with recent figures showing up to five permits [to destroy cultural heritage] being issued a week" . New South Wales remains the only state without independent culture and heritage legislation. The situation in Tasmania is similar. "We have found that since [Tasmanian] Minister [for Environment, Parks, Heritage and the Arts] Michelle O'Byrne took over responsibility for Aboriginal heritage, more than 30 destruction permits were issued under her name without any involvement of Aboriginal people," says Michael Mansell, Director of the Tasmanian Aboriginal Legal Centre . Rock art threatened by development. This photo was taken in February 2005 when a road still covered parts of the Aboriginal rock art. The main piece is within the white fence. Five years later the road had been closed and partly removed to conserve the site. Excavation or destruction of registered sites is prohibited by law and fines apply. If you believe that there may be an area under threat that has cultural significance you can contact your local traditional owners (through an Aboriginal Land Council) or the a government department (for example in NSW the Aboriginal Heritage Office) and have the area investigated. Fine for Xstrata Mount Isa Mines after the company pleaded guilty to damaging an Aboriginal cultural heritage site. 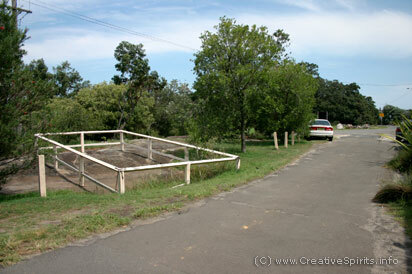 Xstrata had bulldozed cultural heritage objects including flint spears and knives while upgrading a road . Fine ordered by a court for knowingly destroying two ancient Aboriginal camp sites, despite the miner's expert identifying the sites . Percentage of the world's mineable high-grade uranium deposits which are located in Australia. Number of litres of Great Artesian Basin water BHP Billion's Olympic Dam mine uses every day, free of charge, the "largest industrial user of underground water in the southern hemisphere" . Percentage of mining activities in Australia that take place on Aboriginal land . Number of leaks, spills and licence breaches of the Ranger uranium mine in Kakadu National Park since it opened in 1981 . Mining interests collide with Aboriginal land interests ever since Australia's rich resources were discovered. Many political decisions were not driven by the best interests for Aboriginal people but by revenue generated by Australia's resource industry. Development pressure by the resources industry for many remaining wilderness areas is "extensive and imminent"  and it appears that the industry often uses "stand-over and divisive tactics" to pressure Aboriginal groups into entering deals  rather than consulting with them properly. Jillian Marsh is a member of the Australian Nuclear Free Alliance (ANFA) Committee and a custodian of the Adnyamathanha people of the Flinders Ranges in South Australia. She says that "extensive case study research and the concerns raised by Aboriginal people at the grass-roots level shows that mining agreements have not improved life for Aboriginal people, and uranium mines mean more problems." "It is cynical for the uranium industry to act as if it can deliver for Aboriginal people. The main lasting effect of uranium mining for Aboriginal people is radioactive waste on their country, and no resources to clean up the mess left by miners" . Toro Energy’s Wiluna project, which was given the go-ahead in April 2013, projected to store 9.1 million cubic metres of radioactive mine waste in a lake bed . In December 2013, a leach tank burst at the Ranger uranium mine, located in the Kakadu National Park in the Northern Territory, spilling 1 million litres of highly acidic uranium slurry that engulfed the mine and breached containment lines , a spill considered "one of the worst uranium disasters in Australian history" . Ranger has experienced more than 200 spills, leaks and breaches since opening in 1979 . Communities surrounding nuclear mines and bombs sites have noticed cancer clusters, increased health problems such as diabetes, kidney failure and ill health . Watch the plea of traditional owner Auntie Beve against New Zealand-based sand mining company Rocla's plan to build a mine on a sacred Aboriginal Women's Fertility Rites songline and teaching place, in Calga on the Central Coast NSW. Watch how the Wangan and Jagalingou people vow to fight for their Dreaming, against mining giant Adani and the Queensland parliament which endorses the mining project. blown away by a legal overlay. Whose song is singing, whose law is reigning? for a moment's illusory dream of 'progress'. Poem by Deborah Wall . Read more Aboriginal poetry. No more threats after 2100? Maybe, around the year 2100, the threat to Aboriginal land by the resources industry has become obsolete. Mineral resources are not endless. Australia's gold and zinc deposits are estimated to be exhausted around 2044, followed by LNG (gas) in 2072, iron and steel in 2082 and black coal, aluminium and copper around 2100 . Only nickel and uranium last another 27 years beyond that. Will Aboriginal people get back their lands? If so, in what state? Further reading: Read how mining activities threaten the oldest gallery of Aboriginal rock engravings on the Burrup Peninsula in Western Australia. If politicians have to decide between money and culture, in most cases, money wins. In the 1970s, with an impending visit of a Japanese Prime Minister hungry for resources, Gough Whitlam's Labor government rushed to secure a site which would become the Ranger Mine. Despite opposition of the traditional owners to the mining of uranium on that site, in a landmark environmental inquiry into Ranger in 1976, Justice Russell Fox noted that "we form the conclusion that their opposition should not be allowed to prevail", acknowledging at the same time that "the arrival of large numbers of white people... will potentially be very damaging to the welfare and interests of the Aboriginal people there" . 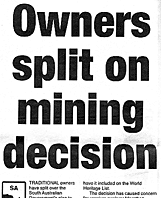 Based on his recommendations an Aboriginal veto on mining at the site was expressly disallowed. In another case, when it took too long for an agreement to be reached between Western Australia, developer Woodside and the Kimberley Land Council, Western Australia's premier simply announced that his government would compulsorily acquire the land where a $30 billion liquefied natural gas site had been proposed . This decision is significant because acquisition powers are usually reserved for acquiring interests in land for a public purpose. Traditional owners were "furious, absolutely mad angry" about the decision which for them confirmed "that every time you move forward and put your hand on someone's shoulder for a bit of support, they turn around and bite it" . In 2009, after a successful court challenge by traditional owners to environmental approvals given under the Coalition government of John Howard, Xstrata CEO Mick Davis threatened to close the mine and sack its 300 workers on Australia Day if the present Liberal government under Kevin Rudd did not intervene to validate the project. Then Greens environment minister Peter Garrett swiftly complied... . In 2014, Crown Lands Minister Kevin Humphries, without any consultation with Aboriginal Land Councils, introduced the Crown Lands Amendment (Public Ownership of Beaches and CoastalLands) Bill 2014. Its aim: extinguish Aboriginal land claims over the state's beaches and coastline . After a rally and protests by land councils Humpries withdrew the bill two weeks later. They clearly haven't talked to Aboriginal people who would not unilaterally shut down beaches. The government's line of argumentation reminds of patronising comments to the Blue Mud Bay High Court decision of 2008. Environmental impact rules may still allow for the destruction of sites of cultural significance to Aboriginal people, concludes Dr Jillian Marsh in a research study into negotiations between a mining company and representatives of an Aboriginal community . According to Dr Marsh, some negotiations between miners and Aboriginal communities are "tokenistic" and carried out in an atmosphere of fear, suspicion, bullying and compulsion. Sometimes community members are forcibly removed from public meetings. "My research suggests that Aboriginal communities are not opposed to mining or development – but they are opposed to the destruction of their culture, their land, their sites, and to the bullying that goes on around mineral exploration and mining," Dr Marsh said . The Ranger uranium mine in the Kakadu National Park, Northern Territory, leaked about 100,000 litres of contaminated water a day for 30 years from its tailings dam—but an 18-month review completed in 2010 failed to find where the water had gone . Heavy rains during the wet season can be dangerous when dams are at capacity. The Ranger mine has had more than 150 leaks, spills and mishaps since it opened despite opposition from Kakadu's traditional owners in 1981 . Mining companies are unlikely to abandon their leases with some estimated to contain uranium worth more than $18 billion . Aboriginal people feel disempowered by the complex processes, legal talk and are often forced to accept. Along with the economic loss of access to their land and traditional food sources goes the spiritual loss of their connection to country. The following video was recorded during a supposed 'native title' meeting between representatives of mining company Fortescue Metals Group (FMG) and members of the Yindjibarndi Aboriginal people about the company's Solomon Hub project. The video is an example of the above mentioned bullying of traditional owners into a land use 'agreement'. Pay attention to the audience and how much they might understand of what is being said. Watch part two of the video. Believe it or not, but cremated remains are threatening to confuse carbon dating of archaeological sites and rock art. People have started to deposit the cremated remains of their loved ones at popular sites, such as Uluru in Australia's Northern Territory. But these confuse archaeologists trying to carbon-date Aboriginal rock art. "Only this year we've seen three different spots [at Uluru] in the last three months," says Mick Starkey, an Anangu man and ranger for Uluru National Park . "It's going to whack all the dating out." Cigarettes make up the majority (46 per cent), followed by paper (16%) and plastic items (6%). Car parks are among the worst places for litter. The Noxious Weeds List listed 478 weeds in June 2010. About 65% of the weed problems in Australia come from gardens or parks. Since invasion more than 85 animals have been introduced to Australia. This impacts the traditional ways Aboriginal people live and damages their culture. For example in 2013 during excavation work at the world heritage-listed Cascades Female Factory Historic Site in Tasmania.